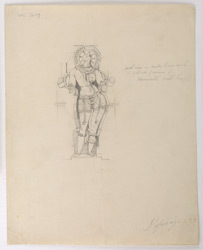 Pencil drawing by Frederick Charles Maisey of a sculpture of Ardhanarishvara from the Visvanatha Temple at Khajuraho, dated 1845-1852. Ardhanarishvara, depicted in this drawing, is the combined form of Shiva and Parvati. It symbolises the trascendental wholeness of Shiva in which opposites are integrated. The right half is the male side of the god while the left half his female side. The sculpture is situated in a niche of the Vishvanatha Temple which was built by king Dhangadeva of the Chandella dynasty in 1002 as indicated by an inscribed slab found in the temple. The temple is raised on a terrace and consists of a sanctuary surrounded by a passageway, a mandapa or hall, a porch and smaller projecting porches. The mandapa and the porch have pyramidal roofs while the sanctuary is covered by a tower with projections and miniature tower-like elements. The outer walls are adorned by three rows of sculptures depicting amorous scenes. The temple used to be surrounded by four smaller shrines but only two are still standing.